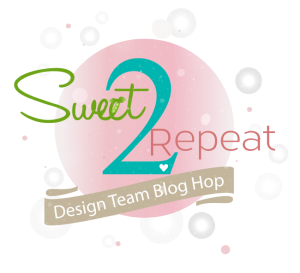 It’s time for the SugarPea Designs Sweet2Repeat Blog Hop! Now that you have had a chance to play with all the fun goodies from the Summer Release, all the SugarPea designers have created even more projects to inspire you! And there's a prize! Be sure to check out the SugarPea Designs blog post for details. I decided to go graphic with some dramatic black silhouettes. I created a bold background with distress inks and an acrylic block - inspired by Jennifer McGuire here. As you can see, the blue ink didn't spread really well in that bottom corner, but I think it actually makes it look like the water is sparkling in the sun - perfect - just like I planned! lol! Once the distress inks were dry, I stamped my palm tree and sentiment. To give my palm tree an island, I got creative with a leaf stamp. Then I used the vein of the leaf to underline the sentiment, giving it an even more hand-written look. Looks fabulous Ardyth totally works, love this look. Great card. Love the 2stamp sets that you used. Great CAS design, Ardyth. Love the distress ink bg. I love this colorful tropical rainbow card! Awesome design! I'm back! Had a fabulous long visit with Brady - so nice to have her home! Four weekends in a row of family events/company was definitely fun...and exhausting! LOVE, LOVE, LOVE the bright colors and the little bits of bling that perfectly mimic water droplets! This is gorgeous! The background is amazing and the perfect backdrop for that palm tree! Beautiful 1 layer card, loving the colors behind the palm silhouette! LOVE your background that you used on this!! Such a fun card!! super creative idea for the beach! love the colors ! Love the colorful strip for this tropical scene. I love that block technique and how you used it to highlight your silhouette. LOVE this card. The 'imperfection' with your blue ink is actually perfection as it really adds a lot to the scene. I think the blue looks perfect. Love your card. Beautiful card...love your gorgeous watercoloring. What a great summery card. I just love it. TFS. X. (Love your name too as it's so unusual) .x. I think your card looks great! I didn't think the blue ink looked bad at all! This is a very pretty card! The silhouette against the rainbow background is very striking. Pretty! These images are the sweetest! Love them! Awesome background colors and silhouette design! Pretty card! Simply adorable! Love the background on this!